Breaking ground, from left to right: Tom F. Moritz, Amtrak senior director Business Development; Michelle Kichline, chair of Chester County Commissioners; Toby Fauver, PennDOT deputy secretary for Multi Modal Transportation; Pennsylvania Sen. Andy Dinniman; Trip Lukens, Tredyffrin Board of Supervisors chairman; Jeffrey Knueppel, SEPTA general manager; Joe McHugh, Amtrak vice president State-Supported Services and Business Development; and Theresa Garcia Crews, U.S. Department of Transportation Region 3 administrator. PAOLI, PA. – On February 28, 2017, federal, state and local officials joined together with SEPTA, Amtrak and their honored guests to officially break ground on the Paoli Station Accessibility Improvements Project, a $36 million initiative to improve accessibility, safety and provide operational flexibility at the Paoli train station. Theresa Garcia Crews, U.S. Department of Transportation Region 3 administrator, speaks to the crowd. Amtrak has contracted with Neshaminy Constructors Inc., of Feasterville, Pa., to advance a series of station improvements including a new center island, high level platform, new elevators and ramps, a pedestrian overpass, parking lot improvements, accessibility improvements to the existing station building and upgrades in rail infrastructure to support other project components. Once complete, the project will set the stage for potential further construction of the proposed Paoli Intermodal Transportation Center, a new expansive transportation center envisioned to serve the growing needs of the traveling public and support the Paoli business district and future growth of the area. 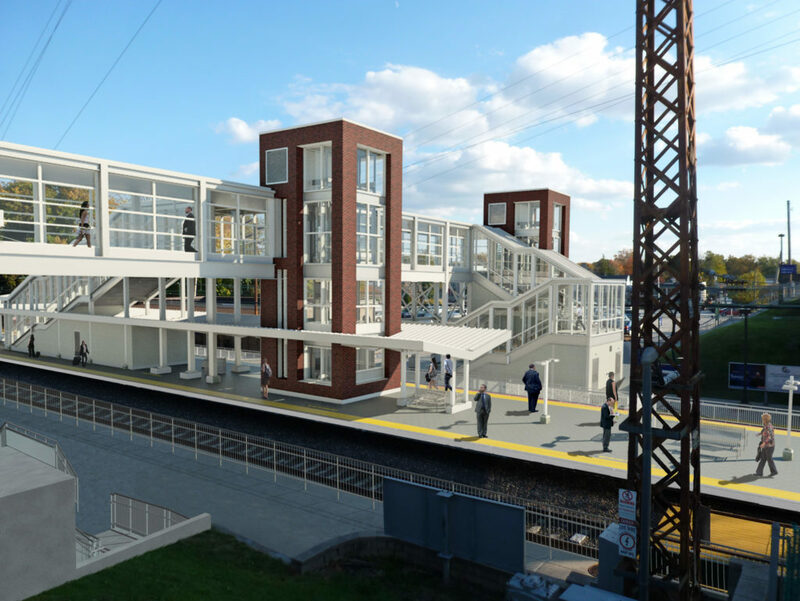 Rendering of the future accessibility improvements at Paoli, Pa., including high level platforms and a pedestrian overpass. “This is the beginning of a renaissance for Paoli, the first of many future improvements near the station that will continue Tredyffrin Township’s important role in helping meet the transportation needs of our region,” said Tredyffrin Township Board Chairman Trip Lukens. In fiscal year 2016, nearly 202,000 Amtrak passengers and approximately 740,000 SEPTA passengers passed through the station, which Amtrak serves daily via the state-supported Pennsylvanian (Pittsburgh-Philadelphia-New York) and Keystone Service (Harrisburg-Philadelphia-New York) trains. The current station facilities, built in 1953 by the Pennsylvania Railroad, including the one-story brick station building, are not fully accessible and are in need of improvement. SEPTA and Amtrak have partnered to make modifications to the station and infrastructure at the station to bring it into compliance with 2006 U.S. Department of Transportation Accessibility Standards.